"Big Bloom is a Natural & Organic Blossom Builder. Our special, micro-brewed formula incorporates earthworm castings, bat guano and other high test organic ingredients that offer a full range of nutrients. Norwegian kelp improves nutrient uptake and increases yields. Rock phosphate helps transfer energy from one part of the plant to another, which means bigger buds and more fragrant flowers. Tiger Bloom is our most Vicious Bloomer with Micronutrients. 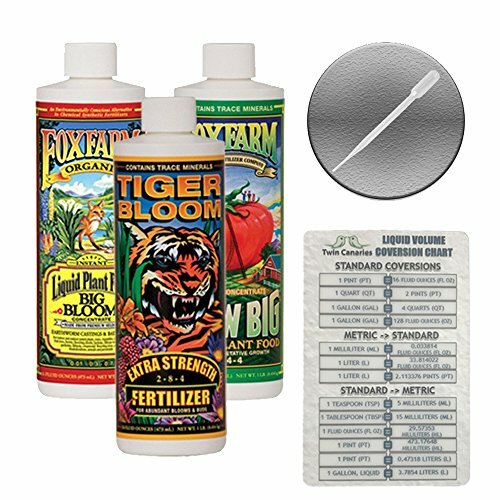 FoxFarm Tiger Bloom is an ultra potent, fast acting, high phosphorus fertilizer that also contains a good supply of nitrogen for growth and vigor. It is formulated with a low pH to maintain stability in storage and keep micronutrients available. Tiger Bloom can be used for both hydroponic and soil applications. When used as directed Tiger Bloom encourages abundant fruit, flower, and multiple bud development. Grow Big delivers Extra Strength Grow Power with Micronutrients. Get your garden going with Grow Big, our fast-acting, water-soluble fertilizer for lush, vegetative, compact growth. Use Grow Big early in the season when young plants need an extra boost. We add earthworm castings and Norwegian kelp into this special brew to encourage sturdier, healthier stems and leaves, but we also provide enough nutrients and trace minerals to create the kind of healthy branching that you'll need later in the season for more abundant buds and blooms.